Electromagnetic waves are absorbed in the atmosphere according to wavelength. Two compounds are responsible for the majority of signal absorption: oxygen (O2) and water vapor (H2O). 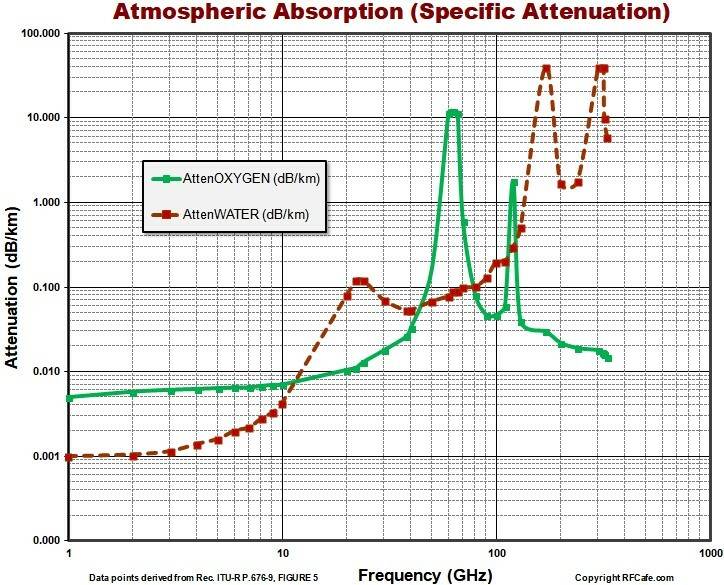 The first peak occurs at 22 GHz due to water, and the second at 63 GHz due to oxygen. The actual amount of water vapor and oxygen in the atmosphere normally declines with an increase in altitude because of the decrease in pressure, so these graphs apply from sea level to around 1 km altitude. 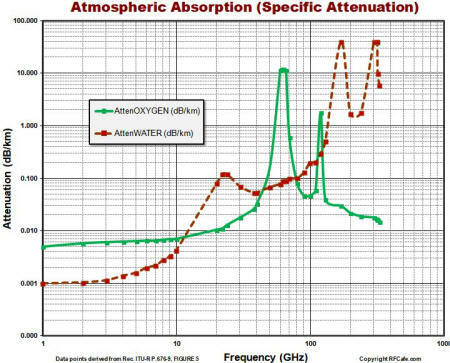 Total attenuation through the atmosphere at any frequency through unobstructed atmosphere is the sum of free space path loss, attenuation caused by oxygen absorption and attenuation caused by water vapor absorption. Rain attenuation, when present adds an additional element. For a chart of sunlight power density in the visible light and infrared / ultraviolet region of the electromagnetic spectrum, click here. This chart was generated from frequency / attenuation data points picked off of a published graph that were entered into Excel and plotted. Here is the official document by the International Telecommunications Union that contains very detailed data.